If you think roasting a whole chicken is a lot of work, I am about to change your mind. Roasting it at a higher temperature for a shorter time produces beautifully tender meat with absolutely no work at all. This method has been around for years, usually called Blasted Chicken, and it is incredibly easy. There is no basting, no trussing, no rubbing with butter or oil, and with me, no spices except salt and pepper, although you can tuck in a piece of lemon, garlic, or your favorite herb if you like. I don’t even wash the chicken, just bring it to room temperature and pat it dry. I like to make this on Friday so we have leftover chicken to snack on, or for chicken paninis. 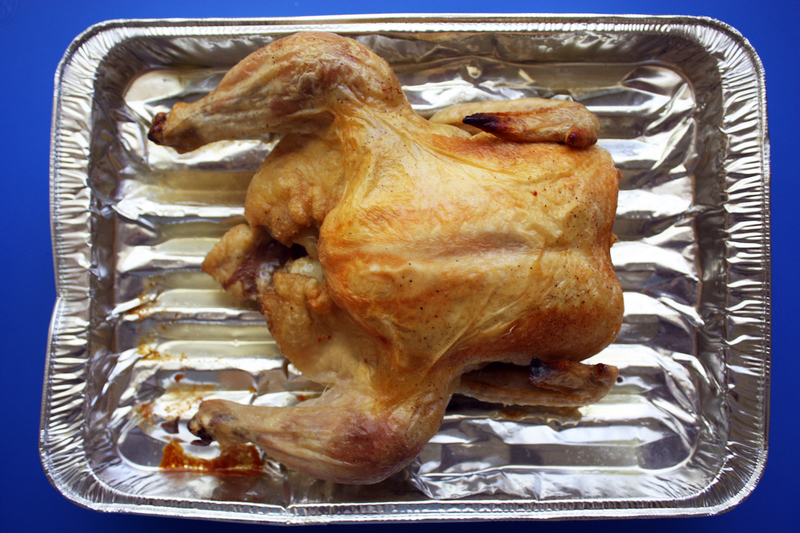 You can roast this chicken on a baking pan but I prefer a broiler-style pan to draw away the fat and I always use a disposable one. I did not invent this method but I want to make sure everyone has this easy recipe for blasted chicken. 3 Comments on "Blasted Chicken is So Easy"
A nice and basic chicken roasting idea. I have never heard of it being called Blasted Chicken, I like it, LOL! I plan on making this soon, I will be adding lemon slices and rosemary or thyme inside of my bird. I also leave the meat I’m cooking on my counter for a bit to warm up. That little bit of time does no harm at all. Now frozen meat is a different thing, I always defrost meat on a plate in my frig overnight. Thanks Jenny! Room Temperature? Really? That sounds way too scary to me. It’s advisable to bring meat to room temperature before cooking. I helps it cook more evenly throughout.